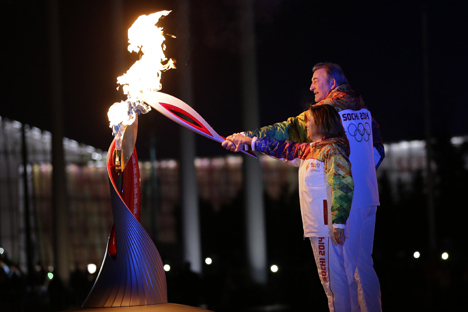 The opening ceremony of the XXII Olympic Winter Games in Sochi, 2014. The Russian Olympic Committee (ROC) fully supports the efforts of the International Olympic Committee (IOC) in the fight against doping on the zero tolerance principle and in protection of athletes clean from doping, the ROC said in an official statement published on May 17. "The ROC, for its part, is willing to provide thorough cooperation in non-biased inquiry into the accusations against the work of the laboratory at the 2014 Olympic Games in Sochi conducted by the World Anti-Doping Agency (WADA)," the statement said. The ROC in the course of its activity also relies upon the necessity of full protection of the rights of clean athletes and upon the principle of inevitability of punishment for those who have tried or are trying to achieve superiority over competitors via any illegal means, defying the spirit of honest sport competition and casting suspicion on universally acknowledged Olympic principles and ideals, the statement said. "The ROC takes the reported accusations against the anti-doping laboratory which worked in Sochi very seriously. The 2014 Winter Olympic Games, according to the estimates of the international community, were some of the most successful in history, and nobody brought into question the qualifications of the international staff working during the games," the ROC said. "If today additional examination in order to verify the fairness of the results and 'cleanliness' of the athletes that were participating in the games is necessary, the ROC will cooperate with WADA and other international organizations in full," the ROC said. Eradication of doping is a common goal and fundamental factor of successful implementation of the IOC's Agenda 2020, in the development of which Russia actively participated, the ROC said. "Russia is willing to take every necessary effort for the effective practical application of it [Agenda 2020], including in the case of implementation of additional means of protection of athletes clean from doping," the ROC said.